As IBPS has released its official calendar of Online CWE for RRBs and PSBs examinations 2019, so its high time to start preparations for the coming year. Looking at the calendar, we have now started subject-wise quizzes for the exam. It will include quizzes of all the subjects- Quantitative Aptitude, English, Reasoning and Computer. All these quizzes will be strictly based on the latest pattern of all the upcoming competitive exams and will be beneficial for your preparations. So, keep following the quizzes which will provide you a set of 10 questions daily. 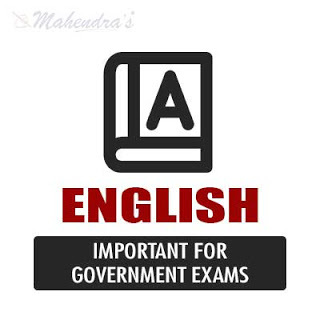 Here, we are providing you important questions of English Language for all banking exams. Q.1-10. In the following passage there are blanks each of which has been numbered as well as filled with a word which may be appropriate in context of the passage or maybe not. If the word highlighted is incorrect and needs improvement then choose any one option suggested given below. But if the given word is correct and requires no change then mark (5) i.e. no change required as your answer. Weather Services have told me that their models don’t work anymore.” Worldwide, the water crises hydra has been quietly growing for decades. Since 2015, the World Economic Forum’ annual Global Risk Report has consistently ranked “water crises” as among the global threats with the greatest potential impact above natural disasters, mass migration and cyberattacks. “Across the densely-populated Indo-Gangetic Plain” home to more than 600 million people in India, Pakistan and Bangladesh “groundwater is being pump about (7) at an unsustainable and terrifying rate,” said Graham Cogley, a professor emeritus at Trent University in Ontario Canada. More than half the water in the same basin is undrinkable and unusable for irrigation due to increased (8) salt and arsenic levels, according to a recent study. Groundwater provides drinking water to at least half of humanity, and accounts for more than 40% of water used for irrigation. But underground aquifers do not fill at (9) swiftly, as a reservoir does after a heavy rain. Their spongy rock can take centuries to fully recharge, which makes them a nonrenewable resource on a human timescale. As a result, many of the world’s regions have passed the threshold that Peter Gleick, president-emeritus of the Pacific Institute and author of “The World’s Water,” has called “peak water”. “Today people live in places where we are effectively using all the achievable (10) renewable water, or, even worse, living on borrowed time by over pumping non-renewable ground water”.